Welcome to the new MainStay Suites offering residential style at affordable rates in a hotel designed for the extended stay travelers. Spacious studios, 1 and 2 bdrm stes offer fully equipped kitchens with large, well-lit work areas, free HSIA and more. On-site amenities include an exercise room., business center, laundry facilities, meeting room, outdoor pool, free daily breakfast and evening reception with complimentary wine and beer, M-W. Walking distance to shopping, dining and entertainment. 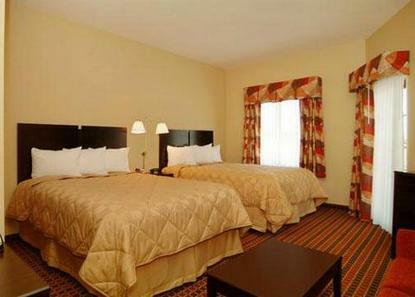 Convenient to Wal-Mart, Sam's Club Corporate Home Office and all Northwest Arkansas attractions.